The Huntsville crew just before things got real. After completing my toughest and most epic race to date at last year's UTMB, I wasn't sure if that level of difficulty could ever be matched by another 100 mile race other than the famed Hard Rock 100. 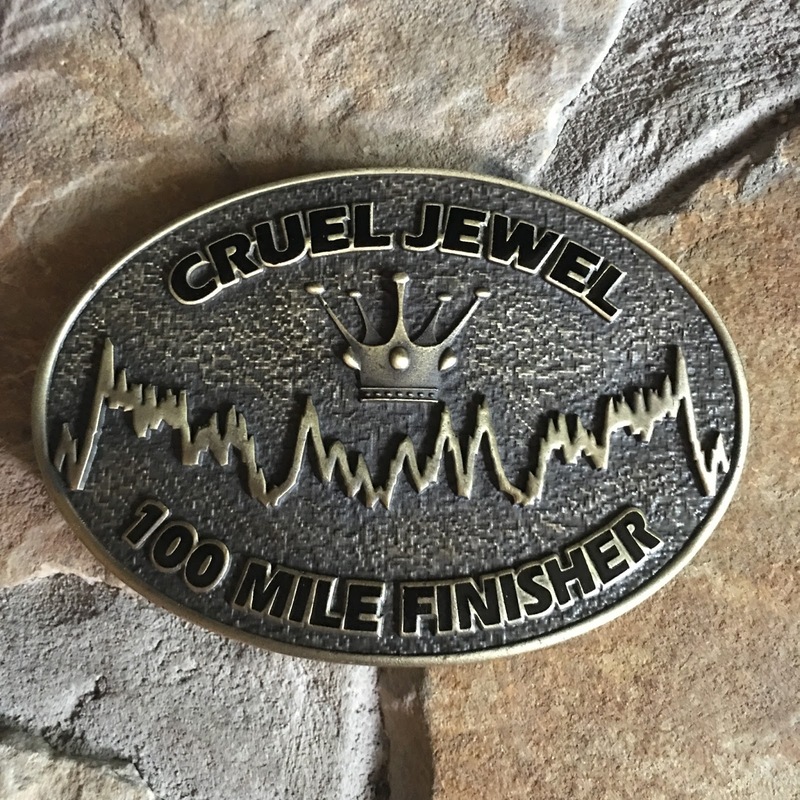 And then I signed up for the Cruel Jewel 100. You'd think I would have known better than to do that. After all, I had run the Cruel Jewel 50 Miler last year in preparation for UTMB. Well, the mind of an ultrarunner is a funny thing, I guess. We somehow have the ability to forget all the misery we endure during these events. So Thursday afternoon after I left the office, I grabbed my bags, jumped into my car and headed over to my buddy Paul's house to meet him and Jerry before all of us piled into his car along with our gear for the four hour road trip to Vogel State Park. I had chosen this race to be my big race for 2016. With its +33,000ft of climb and and +110 miles (according to my Garmin, anyway), it was definitely worthy of being a goal race. I had already run my first Boston Marathon a month earlier and re-qualified for next year's Boston and I was lucky to run the Ultra-Trail Barcelona 100K two weeks later, so toeing the line for the Cruel Jewel 100 Miler was the "crown jewel", the proverbial icing on the cake. 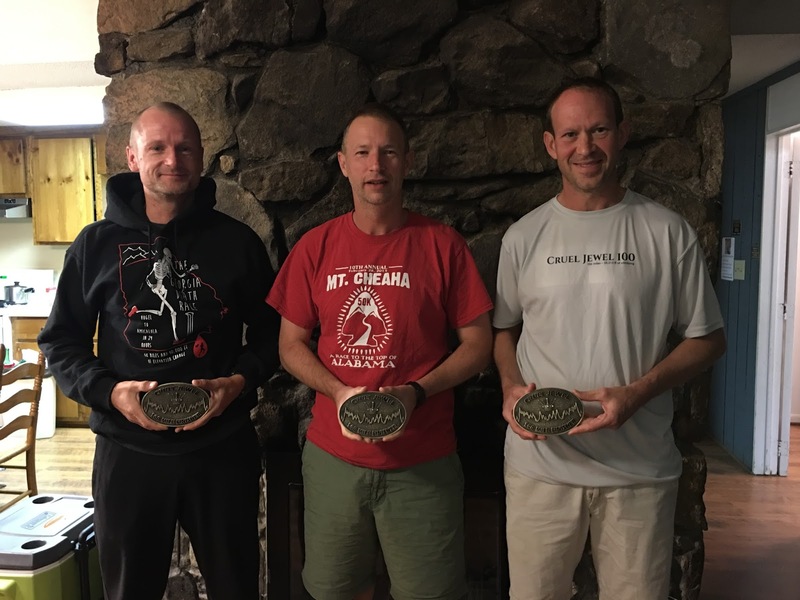 The 100K was a great confidence builder and having ultrarunner extraordinaire and Hardrock veteran Rob Youngren, Crew Chief Ryan Chaffin and my better half Anya all agree to crew/pace me was all I needed to feel like I might actually be able to pull this off. I saw an elf on the trails...and I wasn't even hallucinating, yet. My crew wouldn't arrive until just before the race start Friday at noon and during the early stages of the race, but Jerry had rented a large cabin that would house our crews and us, so we could get a full night's sleep Thursday night before getting our race swag, race bibs and GPS trackers (yup, you read that correctly, for experimental live tracking of runners) just after 9AM Friday morning. We managed to grab some Italian food on our way through Blairsville and after a bit of race gear prep, we all headed to bed in anticipation of a long weekend in the woods. Picked up my good buddy Ryan as my first pacer starting at Stanley Gap AS at mile 69. We woke up around 8AM, more or less well rested. Either way, I had more sleep this night than I've ever had prior to an ultra. Jerry had already made a pot of coffee and was now cooking up fresh eggs, bacon and Avocado. Let's just say I had more than just one helping. So what? Don't judge, I've gotta run through the North Georgia Mountains for 2 days. Two cups of coffee later we trotted to the pavilion by the lake for packet pickup. I am one of Altra's ambassadors, so it was cool to see them be a major sponsor of the race as well as set up shop at the start to let peeps try out some shoes. After grabbing our race packets, we hung around a little, caught up with another fellow Huntsvillian, Chad, as well as some other Georgia running buddies, and then headed back to the cabin to slowly start to get our running gear on. We arrived at the starting line 45 minutes before the 12PM start. Many runners' faces showed their anxious anticipation, including mine. Well, if my face didn't show it, I was definitely nervous. I had gone back and forth about wanting to use trekking poles early or to hold off until much later. I finally made the decision to use them for the climbs from the start. It would hopefully save my legs for the later stages of the race. I am glad to report that was the right decision. I lined up in the middle of the pack while Jerry, Paul and Chad were somewhere in the back of the field. I wanted to try to run or rather move at my own pace from the start. Since it was a rather small field, 112 starters, I was able to do just that. I walked every incline and ran every flat and downhill section. I kept my heart rate in check, but that didn't keep me from starting to sweat pretty quickly. As a result, I made absolutely certain that I would drink both of my bottles of fluids between every aid station to not fall behind on hydration. I also carried both SCaps and Base Salt with me and started using one or the other about 90 minutes into the race. The weather forecast called for mild and warm weather for Friday and Saturday, so I knew I would continue to sweat, especially on the climbs. Hydration and sodium intake are extremely important in those circumstances, though it isn't always easy to recognize if you are low on sodium and electrolytes or if you have too much in your system. This continues to be a never-ending battle for me, but it worked out in my favor on this day. 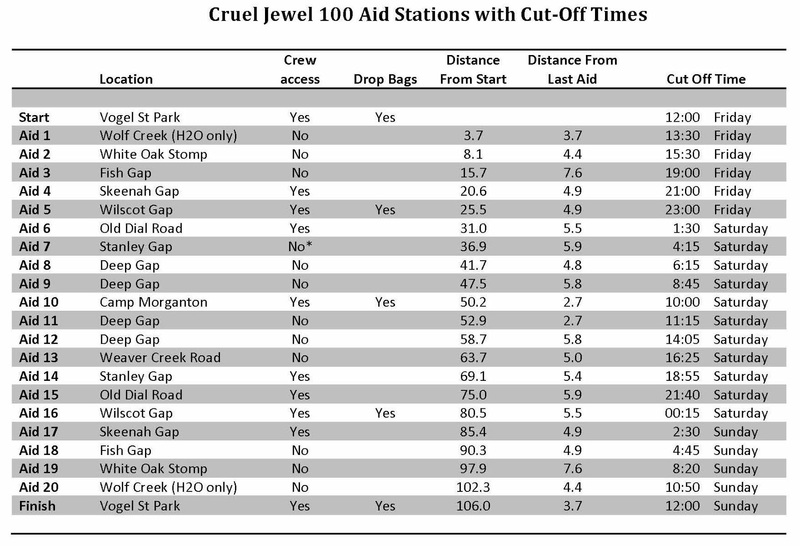 Aid Station chart, which I always carry with me. The first 20 miles were pretty uneventful, in a good way. Considering that most of these miles were on the Duncan Ridge Trail, aptly named the Dragon's Spine, I was feeling pretty good. I never pushed, but when you're on the spine, you still feel like you're working to your max. I stayed as relaxed as I could, always reminding myself that I would be back here again in about a day, give or take a few hours:-) I stopped at every aid station, refilling my bottles and taking in any food available. The aid stations were stocked with the usual fare and my stomach usually doesn't give me any trouble. Today as no different, but I did for the first time lose my appetite for bananas late in the race, which is usually my go to food for ultras. 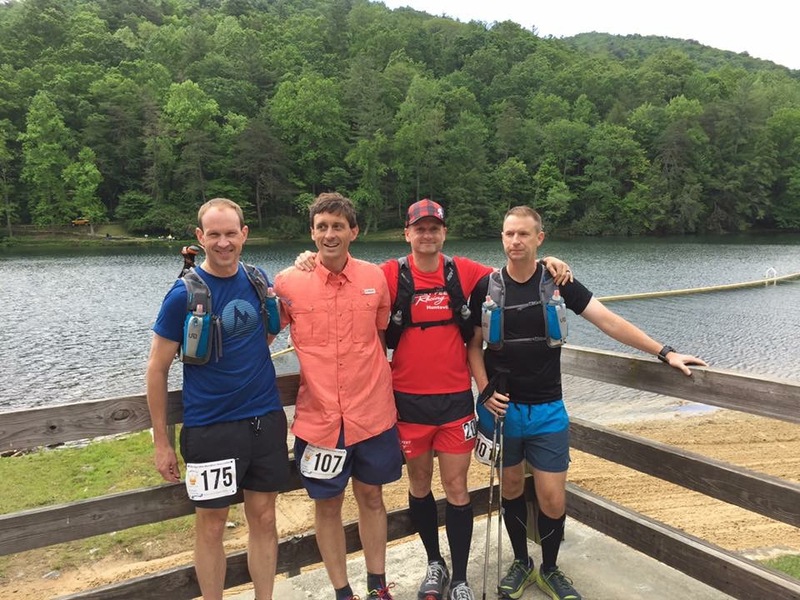 When I rolled into Skeenah Gap AS at mile 20, I was feeling great and excited to see my crew (in person of Ryan) for the first time. He got me refueled and back on the trail in no time. I did take the time to sit down for a minute whenever I had the chance at aid stations and I really think that helped me in the long run. Rob and Anya were still on their way from Huntsville, but I would see them at the next crew access point at Wilscot Gap. I refueled and went on my way. The next section went by fairly quickly, I was looking forward to see my crew again before the long trek to the turnaround point. As I arrived at Old Dial Road AS, I took my time to refuel and enjoy the company. I was still feeling great as I made my way out of the AS. I continued to feel great as I moved from AS to AS, but the first 6 mile loop at Deep Gap challenge my mental fortitude a little bit. I was already starting to have ultra brain, so the math in my head was no longer adding up and I thought I had slowed down significantly already. Thankfully, I came out of that small funk very quickly when I realized that I was actually slightly ahead of my schedule. I rolled in to Camp Morganton after 13 hours and 45 minutes feeling fantastic. It was just before 2AM and I had dealt with the drowsies around 10PM, but feeling pretty alert at this point. My crew was waiting for me at the camp building and there were quite a few other familiar faces that I was excited to see. It perked me right up. I did a full change of clothes and shoes and applied foot powder and body glide in all the right places to prevent blisters and chafing. It worked. I ended up with one blister and no chafing at all. I wasn't really hungry at this point, but I did manage to eat some food. While I did do an equipment change and filled up my pack with provisions, I did make one major mistake. I did not grab my caffein pills from my crew. This was a very costly mistake. On my second Deep Gap loop, I would start to become sleepy. My drowsiness continued to get worse and I would not get better until many hours later when I had literally fallen asleep while hiking out of the Weaver Creek Road AS, essentially sleep-walking, only to be awoken by a familiar voice coming from ahead "What the!!!". It was Jerry's voice. It had been daylight for a couple of hours already. 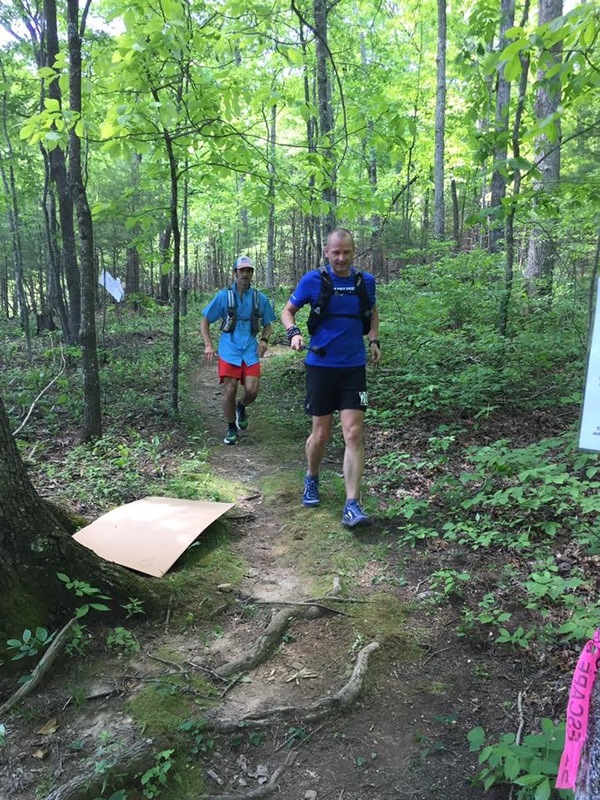 They were about 2 hours behind me at this point on their way down to Weaver Creek Road AS for the out & back section that is added only in the second half of the race. Hunched over my trekking poles as I awoke, I begged for a caffein pill. Thankfully, Paul had some left and hooked me up:-) I chewed it up and washed it down quickly. All of us went on our way and within 5 minutes, I was actually awake and moving "well". Before I knew it, I arrived at Stanley Gap AS, finally seeing my crew again. I was elated. First, I grabbed a Starbucks Double Shot Expresso. I sat down and took in some fuel, emptying small rocks and dirt out of my shoes, before finally picking up my first pacer for the next 6 miles. This was the only "road" section of the course and with Ryan's encouragement, I was able to make up some of the time I had lost during my rather extensive drowsy phase. We kept an easy pace, but I was moving much better and the company certainly was encouraging and a nice change. With the exception of a few early miles, I had been running alone all day. This section went by extremely quickly and before I knew it, we arrived at Wilscot Gap AS where I would pick up my pacer Rob for the final 50K of the race, that also includes the Duncan Ridge trail once again for the final 25 miles of the race. I felt pretty good and my spirits were high. Not once during the entire race did I ever question whether I would finish. The only question was when not if. Rob fell in behind me to allow me to move at my pace without feeling dragged along at an uncomfortable pace. I caught him up on how my race has been going and warned him of things to come, the dreaded Dragon's Spine. However, that section wouldn't start until after Skeenah Gap, our next aid station and the final stop with crew access prior to the finish. I took this opportunity for one final shoe change, I had a couple of hot spots, but still no blisters. New Injinji compressions socks and my third pair of Altras (Olympus 2.0 at the start, Lone Peak 2.5 at mile 50 and now Olympus 1.5) made sure the condition of my feet would continue to be a non-issue for me. Hardrock vet and good friend Rob joined me for the final 50K at Old Dial Road AS at mile 75. Rob and I decided to stop at every aid station to do a mental and physical check. Sitting down for a minute allowed me to collect myself and to make sure everything was still in the "green" area of my scale. Once we started to enter the Dragon's Spine the course became relentless. We'd go either up on seriously steep trails or go down on seriously steep trails. No switchbacks...ever! I swear this course runs much easier in the other direction. Halfway through the final 50K, Rob exclaimed "this is an angry trail". I knew exactly what he meant and a truer statement hadn't been made all weekend. The miles started to tick away much slower, but Rob's company kept me going. He was now moving ahead of me as I was hoping that it would keep me moving forward wile trying to stay with him. He kept the pace easy and waited patiently, when I used pee breaks and refuel breaks to drink, eat and take salt as an excuse to rest. But we continued to move, getting closer to the finish one step at a time. 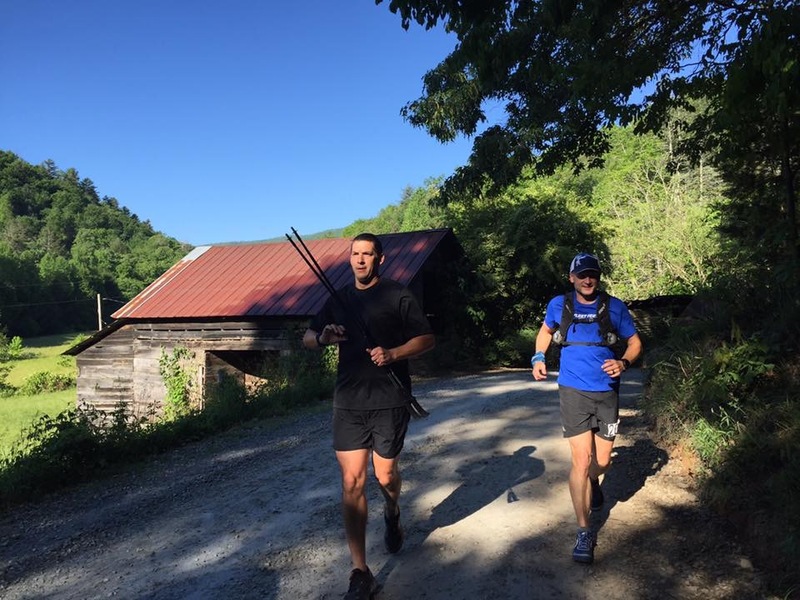 We realized that finishing before nightfall was probably out of the question, but if we pushed a little, we should be able to get up and over Coosa Bald in daylight. It felt like I was moving at sub 7 minute pace as we were flying down the mountain. It was closer to 11 min miles when I finally checked my splits after the race:-) I am glad to say we accomplished that goal. In fact, we managed most of the final climb from Wolf Creek to the state park in daylight. This final climb seemed endless, just like the final descend down Coosa Bald earlier. I was now reduced to walking on the climb, but once we reached the top, I could smell the barn. As we reentered Vogel State Park, we started slowly running down the final stretch of trail, my quads burning. This section of trail felt like forever and I dropped a few F bombs to voice my disapproval. They must had changed the course, I proclaimed. This is definitely longer than yesterday. 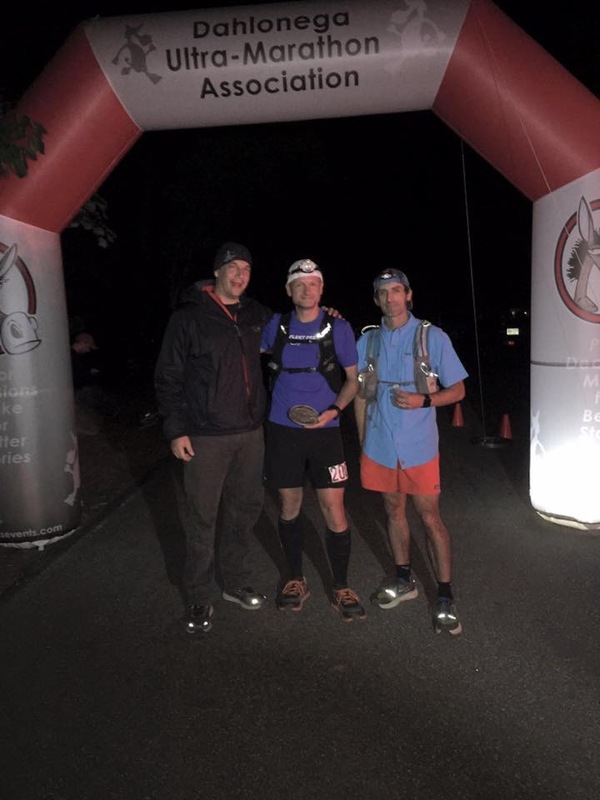 My two pacers and I at the finish just after dark after a short 33 hours and 28 minutes. I received my finisher's buckle (that I would proudly wear for the next two days) before heading inside to stay warm and sit down for some rest...finally. I am proud to say all of my Huntsville buddies finished as well. 4 for 4, pretty impressive finishing rate for an event like this one. The three Amigos the morning after. Thank you to my crew and pacers, thank you to the awesome RD crew and thank you to all of the volunteers who had to not only deal with the same sleep deprivation, but also with a bunch of tired and sometimes whiny (dare I say cray cray) runners. Without any of you, none of us would be able to complete an event like this. This was definitely one epic 100 mile race challenging runners more than any other 100 mile event I've done before. When it comes to assessing the difficulty of this race, Rob summed it up best for me. He is a true Hardrock veteran with 5 finishes and when I asked him if he planned to do this race, his response? "Probably not." This race definitely equals the difficulty of races like UTMB and Hardrock. Are they similar? No, because each of them are unique in their terrain and environment, but all of them challenge runners equally in different ways. At least that's what I think. My Hardrock analysis is purely based on Rob's comments. Hopefully, I get a chance to see what Hardrock feels like for myself in the not so distant future:-) This race definitely prepared me mentally. Some serious bling for finishing this one, its size and weight only equalled by the difficulty of this race. Hey Martin - great job at CJ100. I was the guy who ran with you for the first 20. We were both accused of being too negative due to discussing the suffering that we knew was coming. 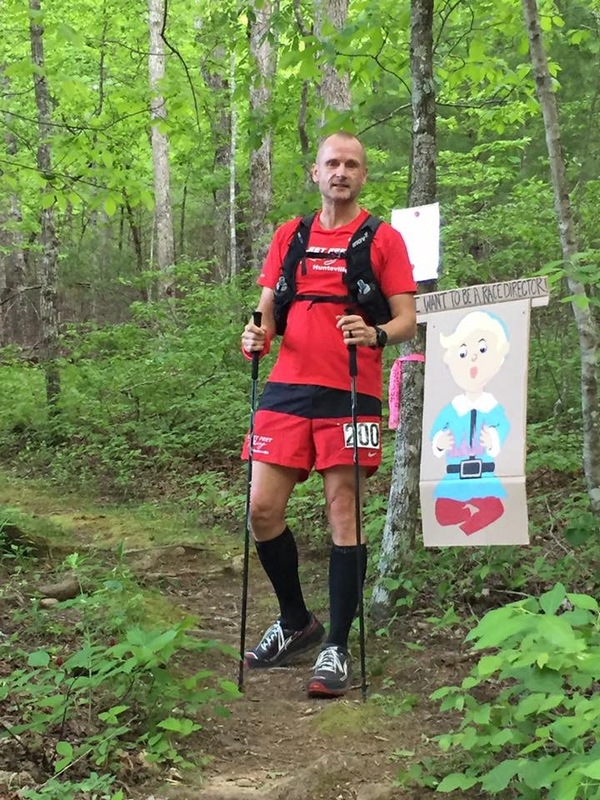 "The first 20 miles were pretty uneventful." It sounds like I made a large impression. Haha. You caught and passed me around mile 90. You then proceeded to put 2.5 hours on me in the 16 miles to the finish... Good work. Continue the mission. Benjamin, I was just lucky to have a great pacer and ultra veteran with me, who I didn't want to disappoint, hence the pickup towards the end:-) To be honest, my memory of the entire race is pretty foggy. I suffered quite a bit through the night. The first 20 miles actually felt like any other race. When I returned there the following night, I couldn't believe how well we ran through there just 24 hours earlier. What's next on your race calendart? See you on the trails. Crystal, good luck, I'm sure you'll do great. Cruel Jewel is a great adventure. I've done both the 50 and the 100 and they are tough but oh so rewarding!